A walk to the east from the Fondamente Nove, brings visitors the Ospedale (Hospital) of Venice and the Cathedral of San Giovanni e Paolo. This is the spectacular pantheon of Venice. Twenty-five Doges, the political leaders of Venice, are buried and memorialized here. Directly next to the Church is the façade of the Renaissance School of Music, (Ex Scuola Musica di San Marco), todays city hospital. The perfect location for your hotel while in Venice is the Locanda la Corte, located only a few moments’ walk from the Campo San Giovanni e Paolo. (See IF YOU GO below for more details). From the Locanda, you can be in the large Campo Santa Maria Formosa, named for its late Renaissance church of the same name, in about three minutes. Unique among all the churches of the city, this one has two entrances, one Renaissance style of 1594 and one Baroque style of 1604.
. You will know it when you see it: two large glass windows display some of the most unusual masks, Venetian or not, in the world. 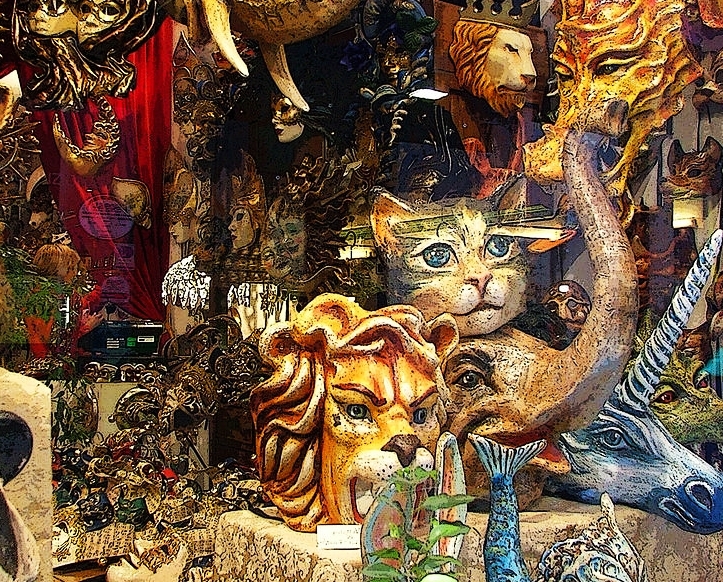 This is a great place to explore the art of mask making at its finest. Next, backtrack through Campo Santa Maria Formosa to the church of San Giovanni e Paolo, taking time to drop off your purchases at the Locanda la Corte. If you find yourself in need of lunch, that is after 12:30PM, ask at the Locanda for directions to the Osteria d’Alberto. This tiny and well known Osteria offers exceptional meals, fair prices and easy access. After lunch? Head to Salva Rosa, located across the square from San Giovanni e e Paolo. This is one of the finest gelato shops in Italy. Next, head east along the Fondamente Laterano. Follow directional signs toward the Arsenale. You will also see signs for the Church of San Francesco della Vigna. This was the first major church built in Venice following the movement of the population from the northern lagoon island of Torcello. A few minutes’ walk beyond San Francesco brings you to the Fondamente, walkway, at the Arsenale, Venice’s world famous ship building yards. During the height of the Serenissima, warships were constructed in as little as a day in this complex of workshops and docks. Walk south along the Arsenale walls and you will come to the Riva along the lagoon, the broad walkway that connects St. Mark’s Square with the Giardini, the garden of the city. At the confluence of the Fondamente Arsenale and the Riva is the Naval Historical Museum of Venice (Museo Storico Navale). The museum is particularly of interest to those with a passion for the sea and the story of Venice’s rise as a naval power on the Mediterranean. When you depart the museum, turn left and walk toward the garden. 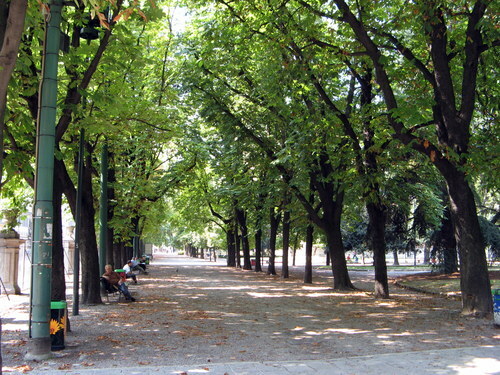 The Giardini is the site of the Biennale in Venice, an international art exhibition. The gardens are a lovely place to stroll, enjoy some coffee at one of the local cafes and relax. After a break, perhaps on a bench with a view across the lagoon, you can board a vaporetto and return to the San Zaccaria dock at St. Mark’s square before returning to your hotel for a break before dinner. There are few restaurants in Venice that can match the combination of exceptional seafood, lagoon view and excellent service of Algiubagio. 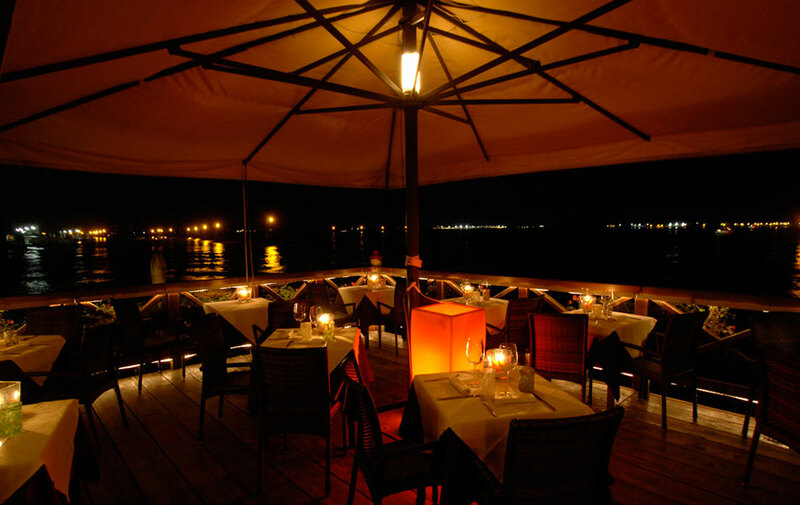 Located close to the Fondamente Nove dock on the north side of Castello, this is a restaurant you must not miss. Evening candlelight, sunset on the lagoon and freshly prepared meals conspire to create unforgettable memories. A stroll across Castello provides a unique experience for those visiting the city – few crowds. This is a treasured neighborhood of Venice and I highly recommend enjoying a visit during your time in bella Venezia. NOTE: If you are headed to Venice in 2013, 2015, etc, you are advised to make hotel reservations well in advance of your arrival. The visitors to the bi annual art exhibition aquickly fill many of the city’s hotels. A perfect base for explorations across Venice. The hotel is a five minute walk to either the Rialto or St. Mark’s Square, offers very clean, well-managed accommodation and a beautiful courtyard for breakfast or an afternoon aperitivo. My recommendation is to walk to the church before 8:00AM. The side door closest to the Locanda is open for early admission at no cost. The silence of the space is a quiet and reflective way to begin your days in Venice.